I’m so excited to return to Blue Print Surface Design and Print Show next month! I’ll be exhibiting with my art collective, Pencil Parade, at Show #1 May 17-19 in New York City. Last year was the first time any of us had exhibited at a trade show and we had a great time. We learned a lot, met some wonderful people, and it was a fantastic way to really step up our game in our work as independent artists and designers. On the one hand I feel immensely more prepared for this year: I know what to expect and I have a lot more confidence in my work. On the other hand it’s always daunting to prepare for a show like this. I inevitably feel like I want to bring my very best work and that just has to be the next thing I make. So I’m constantly chasing my own tail. But I’m bringing some fun new work and I’m looking forward to being in New York again and seeing some friends. If you’re an art/creative director or an art buyer you can register your team for free and please stop by the Pencil Parade booth (#44!). And if you’re a fellow artist who’s going to be in town for the shows, stop by and say hello! I’ll be busy busy for the next few weeks finishing up collections, but here’s a sampling of some recent work I’ll be showing at Blue Print! Introducing the Pencil Parade Art Collective! If you follow me on Facebook or Instagram I've been sharing a new collaboration with three other wonderful women and artists called the Pencil Parade Art Collective! This collective is basically a way for the four of us to promote each other's work, share resources, and support each other in our growing businesses. While we all still operate independently as artists, having a collective allows us to join forces, reach more people, and collaborate with each other. More importantly, as people who generally work on our own it's incredibly helpful to have a "team" on your side. The four of us first met while taking Lilla Roger's Make Art That Sells course last March. We've been meeting for almost nine months now to get to know each other and work on launching this collective. It's been so fun to meet them and I hope you'll now do the same! We live all over the US (Chicago, Minnesota, California, and Hawaii) and we come from different backgrounds, but we have similar goals for our work and we're all in about the same place in our careers. I really look forward to working with them and seeing our businesses (and dreams) take off! In the meantime, if you'd like to follow along on our journey you can visit our new website at pencilparade.com. You can also like us on Facebook and/or follow us on Instagram where we'll be posting art daily. Thanks, as always, for your support of my work and for supporting these ladies as well! And if you know of someone who might be interested in our work, by all means, share! We're all looking to license our art and/or do commissioned work. 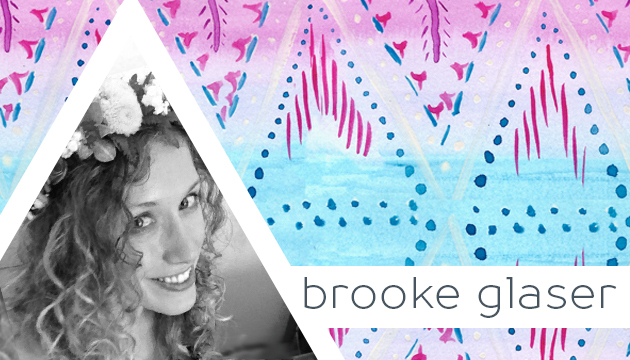 Brooke Glaser of Paper Playgrounds Living in beautiful Hawaii, Brooke is inspired by the tropics and animals, which is evident in her bright, lush work. She currently works in fashion textile design and also teaches art classes. Betsy Siber A mom of two adorable girls, living in Chicago, Betsy does fantastic retro inspired vector artwork along with ink and watercolor illustrations. She also designs & sells fun jewelry! Megan Dunagan of Megan Nicole Designs Megan lives in southern California and has worked in the textile design industry for many years and she loves to share her expertise in that area. Her work incorporates fun and colorful watercolor into her digital patterns and designs. Come see the parade at pencil parade.com!